If you go to Lyon, you’ll find Saint Marcellin pretty much everywhere. It’s the best-known cheese from that region, and the user friendly-sized disks are inevitably piled high at each and every cheese shop you step in to. Locals bake them at home and slide the warm disks onto salads, and I’ve not been to a restaurant in that city that didn’t have Saint Marcellin on the menu doing double-duty as the cheese or the dessert course. Or both. At the outdoor market stands, you can see how popular they are with les Lyonnais. And if you don’t believe me, their presence is so pervasive that I once bought a ticket on the bus in Lyon and instead of change, the driver handed me a ripe Saint Marcellin instead. Like kouign amann, and other things that aren’t from the Île-de-France (the region where Paris is) you often need to go to the source to get the best example. Down in the Rhône, one can find excellent little disks of Saint Marcellin piled up, wrapped and ready to go, at Les Halles in Lyon. That’s where I had the best Saint Marcellin of my life, one which made a table of French friends stop mid-bite and say, simply, “Wow.” Not “Friggin’ wow”, but just a “Wow” was good enough for me. It’s small size means that they carry a very carefully-selection assortment of cheeses. The two men working there can be a tad gruff. Yet other times, they’re as friendly as can be. So don’t be put off. I actually got one of them to laugh. Once. Well, to be honest, it was more of a chuckle. But I savored the victory nonetheless. That’s it, now I can’t ever be happy until I live somewhere that the bus driver gives out change in the form of cheese. Le sigh. Can’t wait to stop by there next week-anything else in the Marais memorable foodwise? I was in Lyon for the first time earlier this year and visiting Les Halles was one of the highlights. The Saint Marcellin from Mere Richard was great, and we also also discovered the dried, aged version. It sounded a little odd, but is fabulous shaved on top of salads. 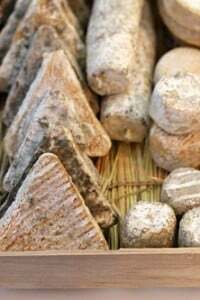 Les Saint Marcellin de la Mère Richard sont excellents mais ceux du fromager Mons le sont aussi, nous faisons des dégustations à l’aveugle entre copains et les résultats sont surprenants ! Yay, you! How’d you know I have to go to Lyon this week for work? Now I have something to look for. Ooh, I’m thrilled for this. St. Marcellin is one of my favorites and it’s always rather moldy and old by the time it gets to the cheese shops here. Can’t wait for a springtime visit to that cheese store! 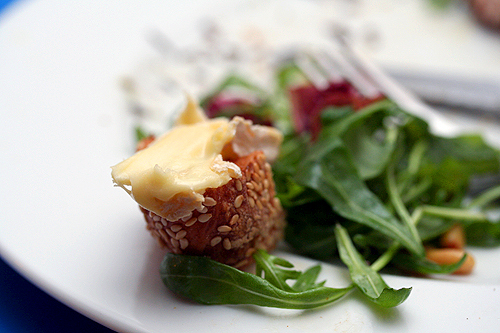 “a little ziggurat of Saint Marcellin cheeses…” How wonderful. I’m heading straight to Pascal Trotté the next time I’m in Paris! Want to meet me there? 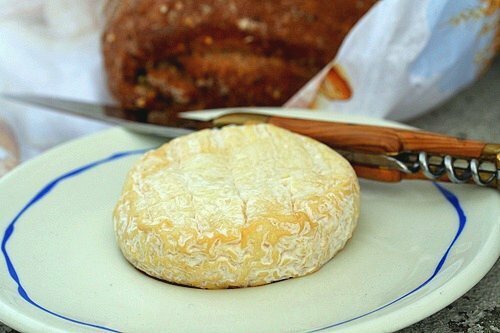 The absolutely best Saint-Marcellin I’ve ever had came from the market in Villard-de-Lans – it was absolutely fresh and buttery and oh-so-delicious! that cheese and baguette picture… purée ! In the local store here in the States, the St. Marcellin comes in a little blue glazed clay dish. One of my favorite cheeses-so far. Thank you for writing a post on what I consider to be one of the best cheeses on the planet! Just having moved to Paris a couple of months ago, and being an enormous foodie (I sometimes am scared by the extent to which I live and breathe for food), I’m so happy to read this blog and get some insight on what’s good in this city. So, I’d just like to say, thank you! i live next door to the cheese shop on rue St. antoine and they are exactly as you described except i never for them to laugh. not even once. I am completely addicted to Molly Stevens’ recipe for savoy cabbage gratin with Saint-Marcellin. Who knew cabbage could be so delicious? Okay, the next time that you’re aux environs de Lyon (and you have a car), please check out le Vieux Moulin in Alix (http://www.lemoulindalix.com/). Owned by dear friends of mine, the salade aux foies de volailles is to die for. I am going to head down to the cheese shops here in Ottawa at the Byward Market, to see if I can get my hands on some-because it looks friggin’ delicious. If not it will have to wait until September. Gruff old guys often purvey the best food goodies. In Laguna Beach, mid ’70s, two wine store proprietors schooled my husband and I in the best wines for least money. First purchase they steered us to was an $8 bottle of Mondavi cab back when that label set the California standard. Today down the Silver Strand – another beach, another time – two gnarly brothers make and sell donuts from a window in their shack by the side of the road. Their hours, their donut choice, and expect no conversation. Such light little puffs of sweetness! And I once made one of the brothers chuckle, quelle triomphe. And, you know ?, Saint Marcellin is a small town not far from Grenoble, in front of the great “Vercors” mountains. St Marcellin is one of my all times favorite…The one on the picture looks amazing, YUMMM….. The first time I had Saint Marcellin was outdoors at Cafe Marly next to the Louvre. It was one of those hot Parisian late afternoons. We ordered a glass of wine and Saint Marcellin with a crusty bread. It was oozing out from the first cut into it, until the last bit had been devoured. That was when I realized those were the perfect conditions for eating this cheese. Your pics bring back that day for me. Also, thanks for the tip where you buy it. There are many markets that sell it, and all are a little bit different. Oh. I don’t think I can coherently word anything right about now but….yum. I need one! I am ever so grateful for your cheese posts, by the way. 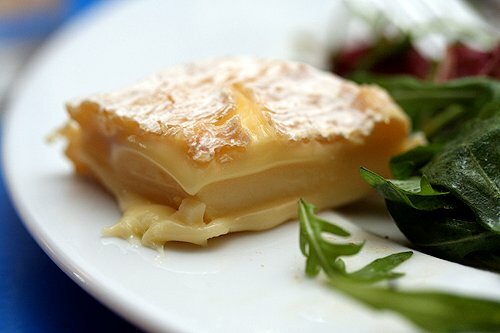 This site is like my French cheese encyclopedia. On a rather different note, do you think any self-respecting Parisian would be caught wearing a koala-shaped backpack? Not even a teenager? Sorry for the ridiculous question, I’m trying to compile a list of gifts to take to some people I don’t know in Paris in a few weeks, preferably Australian things. Of course, you probably don’t know much about Australian things, but am I pushing it too far with silly backpacks? Thank you for your post, as usual very interesting! I just wanted to share with you an address in Paris where you can find not only the best Saint-Marcellin, but also simply the best cheese of all kinds! I think I visited that cheese shop while visiting Paris two years ago. For one idyllic week, my family had an apartment in Place des Vosges. One afternoon with bruised feet and growling stomachs, we shopped for wine, bread, and cheese along St. Antoine and ducked into a little cheese shop. The shopkeepers allowed me to taste a few of their offerings. Oh, my! For this farm girl, one tasted like something swept off the barn floor! Loved Paris! Loved Marais! Love you! I miss my cheeses! Not that you can’t find Saint Marcellin or good Roquefort in the US but it’s a real financial treat! 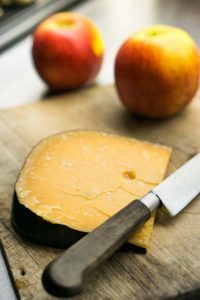 We have come to tweak the French expression “mettre du beurre dans ses epinards” to “mettre du fromage sur notre plateau”… just to give you an idea. Your post made me really hungry! Merci! This is one of my favorite cheeses; I had an omg moment when I first tried it in Arles. I love that fromagerie on rue St Antoine despite the cranky cheesemen. I consider getting a laugh out of a French person one of life’s great pleasures, rare and delightful. Thanks for sharing news of this cheese! MMMMM St Marcellin is my favorite cheese. My friends in Lyon always have a nice runny one for me when I come to visit. the last time it was so deliciously runny, I ate it with a spoon..YUMMMY! 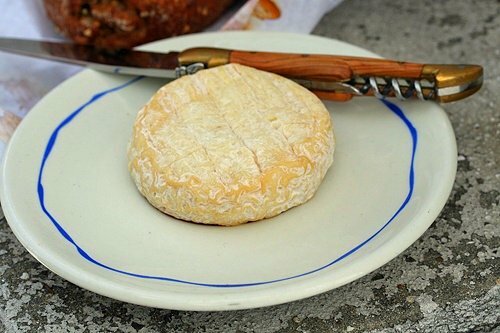 Yep, Saint Marcellin…right up there with Rocamadour, Brie de Melun and Epoisse! This is a truly sainted cheese, full of gout and goo. It is a bargain in Paris considering in London, it costs £7.50 or about 8.50 euros! As to grumpy fromager, these two are well worth the trip and no grumpy fromagers just unbelievably good cheese, incredibly well affiné qnd expert advise : BOURSAULT at Alesia in the 14th or Laurent DuBois at metro stop Maubourg-Mutualite DUBOIS 47 Ter bd St Germain 75005 PARIS 09 65 19 36 85 or his other shop FROMAGERIE LAURENT DUBOIS 2 r Lourmel 75015 at Dupleix metro stop. It seems to me that the two grumpy guys at Fromagerie Trotté are never both grumpy at the same time. One of them is usually quite nice and helpful (usually the younger looking one). Although I have switched to buying cheese at the Richard Lenoir market; it’s typically much cheaper and equally good. Shelli: Well, they’re not totally grumpy, just not cheery! (I think I said “A tad..”) I do get cheese at Richard Lenoir: on Sunday, the guy with the Salers and Cantal from the Auvergne (toward the Bastille) has particularly good cheese and sausisson. But Trotté does have Bordier butter and so I usually stop in once a week to pick up a baratte, and usually grab a cheese while I’m in there. I was introduced to a perfectly ripened saint-marcellin at Paul Bocuse in Lyon and have been searching for that taste sensation on every trip to Paris. Can’t get it in Sydney Australia unfortunately. I discovered St Marcellin when I made Molly Stevens’ savoy cabbage gratin — what a dreamy cheese…. I have had this cheese before. They sell it here in Napa at our wholefoods. I am actually writing bacasue I love the clay dish it comes in. Do you know where they get the dish? I woild buy hundreds if I could find them!! Matt Gross of the New York Times wrote a small piece for his Frugal Traveler column in July entitled “In Lyon, A Day Devoted To The Stomach” . 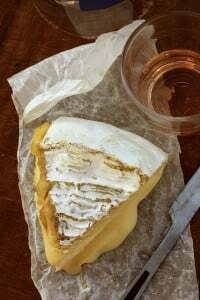 Being the food-obsessed person that I am, I tracked down one of his recommendations and experienced an amazing cheese–a St. Marecellin marinated in white wine from Maréchal at Les Halles de Paul Bocouse. Spent the rest of my month in France trying to recreate that culinary experience, eating local cheese in every town I visited. As a result, my cholesterol is now 265 (!!! ), but, after a little diet and Lipitor, I’ll be back. When I studied in Lyon, I went to a fromagerie in the Croix Rousse and explained I was a foreign student interested in trying a variety of French cheeses over the course of my year abroad. On trip #2, I was handed a St-Marcellin. It was hard not to pick another one up each time I went in, but for the sake of research and trying different options, I was able to cut back to buying it only every other trip to the fromagerie. It’s still one of the first cheeses I pick up when I’m back in France – it’s just not the same in the US! St Marcellin provided my most memorable eating moment in Paris, in a tiny alleyway on the Ile St Louis is a fromagerie called Benard Lefranc which has stacks and stacks of beautiful cheese. The one I left with was St Marcellin and it’s the one I’ll be going back for more of. Amazing. I think we had one every day during our week in Nice last September. A small stall at the market sells very fresh and mild ones, I even could skip the bread with these… so good! does anyone know the name of a dairy where S.Marcellin is made near Lyon?/ i am visiting in September and would like to see the cheese made.